True Potential Wealth Management is part of the successful True Potential group of companies and offers wealth management services to private clients, trustees and businesses throughout the UK. We have corporate offices in London and Newcastle upon Tyne. Established in 2007 by a management group with extensive experience in UK advice distribution, investment management and financial services technology. The True Potential group of companies has been recognised with several major industry awards. Founded the ‘True Potential Centre for the Public Understanding of Finance’ in partnership with the Open University Business School. The Centre aims to make financial education more accessible through its research and free courses available to the public, including ‘Managing My Money’ and ‘Managing My Investments’. Released our True Potential Portfolios to all financial advisers. Added six new funds to the True Potential Wealth Strategy Fund Range. Added four new funds to the True Potential Wealth Strategy Fund Range. Launched True Potential One® lifetime planning tool. Launched Investment Management Firm and eight Wealth Strategy Funds. Introduced our Auto Enrolment proposition to corporate clients. The True Potential LLP group is administrators of more than £67 billion in client assets. Demonstrated impulseSave® live on stage at FinovateFall 2014, a leading financial services technology conference. As one of only five UK-headquarted companies at the conference, it was a proud moment for everyone at True Potential. Received permission to administer our TPI Pension in-house. Launched impulseSave®, a first-of-its-kind technology that allows investors to add as little as £1 to their existing investments. By offering impulseSave® online and via our tablet and smartphone apps, we empower our clients to top-up their investments on-the-go and reach their financial goals. Launched the True Potential Centre for the Public Understanding of Finance (or True Potential PUFin for short) in partnership with the Open University Business School. The centre aims to empower the UK public to better understand their personal finances. One of PUFin’s first acts was to develop a series of free online personal finance courses to help the public learn more about their money. Undertook our first survey of the UK’s savings habits and uncovered some surprising information. The ‘Savings Gap’ in the UK runs deeper and wider than people think, with many under-prepared for retirement. Further quarterly surveys have delved deeper into the savings habits of the nation, each producing their set of shocking results. Launched V6 technology, which offers financial advisers a holistic view of all client information, available on-the-go with seamless data links and integrated planning tools. Launched our Wealth Platform, built entirely in-house, to provide an integrated investment solution for UK financial advisers and their clients. True Potential Adviser Services established with a management group containing extensive experience of UK advice distribution, investment management and financial services technology. 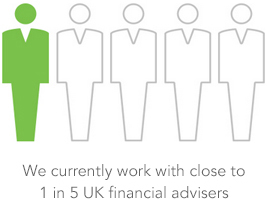 We have the drive, ambition and expertise to continue our mission to revolutionise wealth management. We are committed to pushing technology even further to help clients take control of their finances and financial advisers to provide world-class services. We will always deliver strategies and services that are simple, effective and unique.